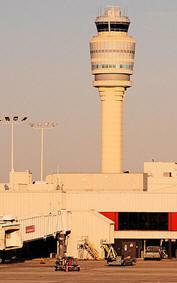 December 22, 2010 - A U.S. Customs and Border Protection (CBP) officer based at Atlanta's Hartsfield-Jackson International Airport was arrested and charged along with 13 others for alleged drug trafficking in a large-scale investigation in which five search warrants were executed in the last 24 hours at locations around metro Atlanta. "Today's indictment reflects the outstanding law enforcement cooperation in this case that unmasked the illicit acts of a CBP officer," said David P. D'Amato, special agent in charge of the ICE Office of Professional Responsibility for the Southeast. "The law enforcement community here in Atlanta and around the country is committed to weeding out those whose acts tarnish the image of the many officers and agents who work tirelessly to keep our communities and country safe." "The indictment charges a Customs and Border Protection agent at the airport with taking payoffs to smuggle guns and drug money from undercover agents posing as international drug traffickers," said U.S. Attorney Sally Quillian Yates. "That investigation led to unraveling a large scale ecstasy trafficking organization and the seizure of over $2.8 million worth of ecstasy from a house in Chamblee - one of the largest seizures in the country." A federal grand jury returned three indictments related to "Operation Rude Beast," which were all unsealed on Thursday. In the first indictment, the following three individuals were charged with offenses, including conspiring to launder drug money, bulk cash smuggling, and attempting to bring weapons onto an aircraft: Devon Samuels, 45, a CBP officer, of Stockbridge, Ga.; Mark Tomlinson, 36, of Stone Mountain, Ga.; and Keisha Jones, 30, a Delta employee, of Stockbridge. In the second indictment, the following 13 individuals were charged with related offenses, including conspiracy to traffic MDMA (ecstasy) and marijuana, and firearms violations: Jerome Bushay, 32, of Norcross, Ga.; Fnu Lnu, age and place of residence unknown; Christopher Dixon, 37, of Lithonia, Ga.; Mark Tomlinson, 36, of Stone Mountain; Roshaun Hood, 29, of Atlanta; Curtis Hernandez, 38, of Decatur, Ga.; Nigel Edwards, 33, of Stone Mountain; Jermaine Campbell, 30, of Dekalb County; Ricardo Duncan, 27, of Lithonia; Dave Grant, age unknown, of Lithonia; Christopher Williams, 33, of Snellville, Ga.; Damien Aarons, 35, of Covington, Ga.; and Fnu Lnu, age and place of residence unknown. In the third indictment, Samuels and two other individuals were charged with conspiracy to commit marriage fraud and making false statements on immigration documents. The two individuals were Carlton Ferguson, 35, and Dahlia McLaren, 29, both of Decatur.According to the charges and other information presented in court, in November 2010, Samuels, a CBP officer, was charged in connection with three undercover sting operations to smuggle alleged drug money and guns through Atlanta's Hartsfield Jackson International Airport. On November 3, an undercover officer, posing as a drug money launderer, gave Samuels about $22,000 in money represented to be from the sale of drugs. With the alleged assistance of his associate, Tomlinson, and by unlawfully utilizing his badge to bypass security and avoid screening, Samuels smuggled the money through Atlanta's airport to Jamaica. Once in Jamaica, Samuels delivered the money to a Jamaican undercover police officer who was posing as an international drug trafficker. Samuels is charged with accepting $50,000 on Nov. 19, in alleged drug money from another undercover officer. Samuels and Keisha Jones (his wife and a Delta Air Lines employee) then traveled from Atlanta to Jamaica, where Samuels and Jones delivered the money to Jamaican undercover police officers. The indictment alleges that while in Atlanta's airport, Samuels unlawfully used his badge to bypass security and avoid being screened. Samuels is charged with accepting five firearms and about $20,000 in alleged drug money from an undercover police officer on Nov. 30. Samuels went directly to the airport with the firearms and money and unlawfully used his badge to bypass security again, smuggling the money and guns into the airport. Once inside the airport, Samuels allegedly gave the firearms and money to a second undercover officer who told Samuels that he was going to transport the firearms and money to Arizona for a meeting with members of a Mexican drug cartel. The indictment also alleges that on several occasions, Samuels unlawfully used his access to government computers to determine whether he or his associates were under federal investigation. Samuels allegedly ran a computer check on an individual involved in a separate drug investigation named Jerome Bushay. In a related investigation beginning around February 2010, federal law enforcement officers began investigating a specific MDMA (ecstasy) and marijuana drug trafficking organization operating in the metro Atlanta area and elsewhere. This organization was led by Bushay and an individual known only as "Otis." Bushay and Otis allegedly used several distributors, brokers, and couriers to facilitate their drug distribution, including: Aarons, Tomlinson, Hernandez, Dixon, Duncan, Williams and Hood. These individuals then distributed the drugs to various individuals throughout the United States. On October 1, pursuant to a search warrant, law enforcement officers seized about 700,000 tablets of ecstasy in one of the largest domestic seizures of MDMA in U.S. history. The tablets were seized at the house at 1855 8th Street, in Chamblee, Ga. Agents found the pills hidden in various places throughout the house, including in the insulation of the walls and in a crawl space near a bedroom. Those tablets have been held for evidence by the DEA. The street value of the ecstasy is estimated at $2.8 million. The OCDETF agents and prosecutors investigating the alleged criminal activity by Samuels began to follow evidence of the officer allegedly using his position to further a marriage fraud scheme. Beginning in November 2009, and in exchange for a fee, Samuels allegedly used his knowledge of immigration practices to assist Ferguson and McLaren in deceiving U.S. immigration authorities into believing that Ferguson's and McLaren's sham marriage was genuine. Further investigation revealed that Ferguson and McLaren married simply so that McLaren could obtain U.S. citizenship. The indictment alleges that Samuels was paid at least $500 for his assistance in that scheme. The indictments also contain forfeiture provisions seeking to forfeit any and all ill-gotten gains from the criminal activity, including properties, vehicles and weapons. The investigation, co-named "Operation Rude Beast," was conducted by Organized Crime Drug Enforcement Task Force (OCDETF) special agents, and from the following agencies: U.S. Immigration and Customs Enforcement's (ICE) Office of Professional Responsibility (OPR) and Homeland Security Investigations (HSI); the Drug Enforcement Administration (DEA); U.S. Department of Homeland Security's (DHS) Office of Inspector General (OIG); CBP; the Anti Corruption Branch of the Jamaican Constabulary Force; DeKalb County, Ga., Police Department; Internal Revenue Service's Criminal Investigation; the Bureau of Alcohol, Tobacco, Firearms and Explosives (ATF); the Bureau of International Narcotics and Law Enforcement Affairs (INL) U. S. State Department; and the U.S. Marshal Service, with assistance from Delta Air Lines Corporate Security.